The intrinsic fluorescence of synthetic or natural porphyrins is regarded as an attractive characteristic exploited for assisting early cancer diagnosis and/or tumor localization. Single tumor cells circulating in the blood stream can be considered a major step in depicting dissemination of primary tumors, an event of clinical relevance for prognosis, staging or therapy monitoring of cancer. The third leading cause of cancer death in men is colorectal cancer and the hematogenous spreading of primary tumor cells is one of the main events in metastasis of this type of cancer. Hidden in the myriad of circulating blood cells, tumor cells need both a sensitive and affordable detection technique. 5- (3-methoxy)-4-methoxycarbonylphenyl)-10, 15, 20-tris-(4- methoxycarbonylphenyl) - 21, 23-H porphyne is a synthetic porphyrin with a noticeable preference of accumulation in peripheral blood mononuclear cells isolated from cancer patients as assessed by flow cytometry analysis. In addition, we found distinct accumulation of porphyrin depending on cancer type (cutaneous melanoma versus colorectal cancer). 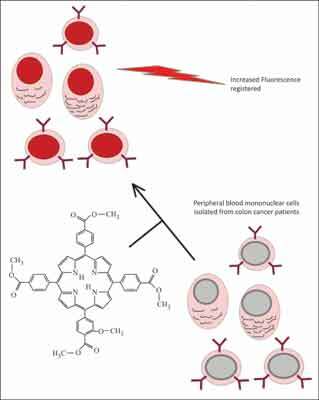 These data lead to the possibility of identifying circulating cells based on preferential accumulation of this new porphyrin in circulating tumor cells because, even accumulated in low percentage of cells the registered intensity of fluorescence was high. Selecting the genetic markers for circulating tumor cells is an option, but high costs and high level of know-how can be somewhat a hurdle for a rapid evaluation. Thus our approach with a new porphyrin can be developed in an accurate and innovative fast tracking method for circulating cancer cells, at least in colorectal cancer patients. Colorectal cancer, cutaneous melanoma, peripheral blood mononuclear cells, synthetic porphyrin. “Victor Babes” National Institute of Pathology, 99-101 Splaiul Independentei, Sect 5, 050096, Bucharest, Romania.